There are so many reasons to throw a celebration, and there are even more ways to decorate for said celebration. Even if you aren't crafty, spending some time to make your place more festive will contribute to the success of the event you're throwing. These DIY party decor ideas are suitable for a wide range of get-togethers. Each party decoration will enhance the ambiance of your event without costing you a ton of money in the process. Photo booths are always a party hit, but now bright photo backdrops have taken over Instagram feeds. Design a festive, colorful wall using crepe paper and glue dots—this project is fast, cheap, and it will last the whole party. Watch or take part as your guests snap selfies and "candids" for their 'grams. A colorful garland fashioned from tissue paper and twine is not only easy, cheap, and colorful, it's versatile to fit any celebration. Dress up a dessert or snack table, frame a mantel, or jazz up a doorway. There are endless ways to incorporate this fun fringe garland into your next party. Paper fans are a classic party decoration that truly work for any type of event. 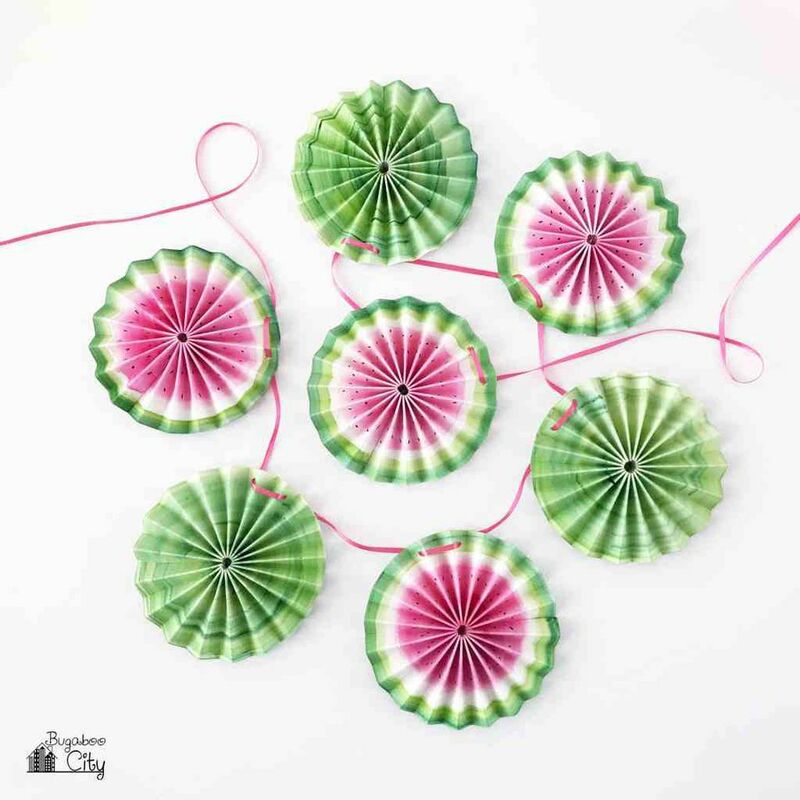 Make a whole bunch, using a variety of decorative paper and patterns, and hang from the ceiling at varying lengths. They also look great on a wall, clustered together in a random grouping. Flowers are a must for events like weddings, but they can even dress up a small dinner party or cocktail hour. If you're on a budget, buy one larger bouquet then split it up among small vases and other eclectic vessels like a teacup. Paper lanterns might be too fragile to make their way into your everyday decor, but they are perfect for parties because they are inexpensive enough to make a handful of them. When the party is complete, you can either save them or throw them away if they become damaged. You might spell out something obvious like "happy birthday" on a banner for a birthday celebration. However, even a dinner party amongst friends could use a glittery word banner. If you can't think of what to write, "cheers" is a good declaration for pretty much any occasion. Balloons are inexpensive and scream "you're at a party!" Believe it or not, there are a multitude of ways you can keep balloons looking sharp and designer-worthy. One way is to create a garland with variously sized balloons and flowers. Consider using white or other neutral shades for this project. Buying a piñata from the store is easy enough, but then you're limited to the designs they have available. Instead, you can make this very straightforward piñata using a paper bag and tissue paper. In some cases, this piñata might serve better as just a decoration and not one you'd use because it would open relatively easily compared to some that are constructed from cardboard. One simple way to add decorations to your party is to turn your food into part of your decor. Decorate food with flags, labels, and other toppers. Also, make sure the levels of your food vary. For instance, these varied cupcake stands will easily draw your guest's eyes to the dessert table. There are a few different ways you can make your drinking glasses more memorable for a party. This foolproof method involves cutting gold adhesive vinyl into different sized triangles and layering them onto the glass. Don't try to make your pattern too perfect. The more variation, the better. Cake toppers work well when you want to keep the cake simple without writing on it, but still want it to look decorated. This garland cake topper idea is perfect for a general get together where there's no message you want to send like "happy birthday" or something wedding related. Throwing a spring bash? Consider this colorful addition to your dessert table. You can hang balloons in an entrance or at the end of a streamer, but that is a pretty basic way to use balloons to decorate a party. Instead, think about creating one focal wall in your space using multicolored balloons. Keep the rows and columns of the balloon wall level with one another for best results. DIY party decor doesn't have to be expensive. In fact, sometimes all you need is a sheet of colored paper and some patience. The more paper starbursts you create, the more impact they'll have on your decor. Cluster them into a bowl or hang them from a string from the ceiling. There are so many different types of paper garlands you can make for a party. However, if you're throwing a general party for no reason, keep that garland pretty general, too. Perhaps match the garland to the season instead. This watermelon garland is perfect for summer get-togethers. Egg-related DIY party decorations aren't just limited to Easter. You could use these at a gender reveal, a spring dinner party, a wedding, New Year's Eve, or even a bunny-themed child's birthday party. The point of filling them is that they will eventually be broken during the party, and the confetti will be thrown about. Think about how you will have your guests smash the eggs and for what reason. Creating something that is blogger-worthy can be intimidating, which is why there are tutorials and templates to guide you. You can replicate this feature wall for a party very easily by downloading the template then using that as your cutting guide for these colorful tulips. Creating a centerpiece over a food table at a party doesn't always have to happen at the center of the table. Consider floating something above the table to add interest and draw your eye to that section of the room. This idea converts simple white balloons into hot air balloons using cardstock, thread, and a hot glue gun. The most important part of decorating for a dinner party is the table. In fact, the table is going to function as the main party decor for your event. Make sure you go the extra mile to have each place setting set up before guests arrive. To dress up the table, paint some simple designs on napkins using fabric paint. Balloon arches are a popular way to decorate for a party, and they come in varying degrees of difficulty. Some require hundreds of balloons that get tied together to cascade down a table. In this case, the arch is very straightforward and easy to recreate. It's easy to buy ready-made streamers and twist them around an entryway. However, if you make your own streamers, you can get very specific with the look you want. You can make them thick, you can customize the color, and you can create different lengths of fringe. Tablecloths pull a party together by covering unsightly serving tables. Instead of white plastic, opt for a tablecloth that adds a pop of color by dyeing fabric in shades that make sense given your other party decor. Another way to use a tablecloth as party decor is as a backdrop for a food table or photo booth. Party decor has evolved from twisted streamers to backdrops. The more eye-popping your backdrop, the more festive your party is going to feel. One idea is to set up an area for a photo booth and use paper chains to anchor the space. If you throw a lot of get-togethers and the idea of buying fresh flowers every time seems intimidating, maybe make some beautiful paper flowers instead to use as centerpieces and accents. What's a kid's party without party hats and favors? This craft project works as both. The kids can make pretend with their crowns, and once the party is down, they can take their crown home with them. You don't have to add a horse figurine to a stir stick necessarily, but anything you add to make the stick more festive will enhance the look and feel of your party. Simply purchase clear stir sticks and embellish as you see fit.